Times change and long standing clubs all over must change as well if they want to keep membership levels at a level that will cover expenses and provide a robust group atmosphere for new members. The Washington State BMW Riders are no stranger to the evolution of clubs, having started back in 1972. In 1999, the club had 240 households registered as members, today that number is 200. Photo: Working on a next generation club member. But in the last 15 years the club has found ways to make ends meet. Moving their monthly club newsletter from print to PDF format saved the organization thousands of dollars in printing costs and allowed them to use the savings otherwise. But with the loss of a printed version, pass-along rate diminished as well. At the same time, the club website was split into a general public front end and members-only forum. As many clubs have experienced, getting younger riders interested in joining a club with paid membership is like trying to sell a Cadillac to someone wanting a Smart Car. 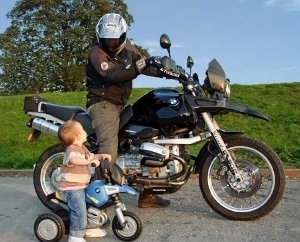 There are many paid clubs to choose from if you’re a BMW enthusiast or motorcyclist in general (BMW MOA, BMW RA, AMA etc…) So can a younger person on a budget afford to pay for all the national as well as local options? And then one has to consider all the free alternatives such as a number of motorcycle meet-up groups you can join for free on the internet. Above: The club newsletter, available to anyone regardless of membership status. Recently the club voted in new co-presidents. The combination has worked well in the past by not burdening a single person with presidential duties, allowing the volunteer position to be a little more relaxing. It also makes transitioning to a new co-president easier when one is already in place. Typically each co-president serves two years. And we all know two heads are better than one. Eric Bell and Dan Muir now hold the posts. Both are fairly new to the group. Immediately the two identified there was little attention being paid to the Adventure/Dual Sport members and have begun to map out a strategy to offer both the perennial road rides with the addition of dual sport treks in the coming months. Another recent change that can help draw new members is the addition of a mobile functional website, allowing those who like to digest content with their thumbs to navigate the site a little more easily. 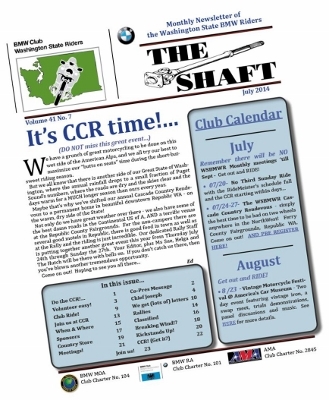 While the forum remains closed to non-members, interested non-members can browse through past club newsletters, The Shaft, without logging in. Another sharing of duties has been having two ride coordinators, rather than one. Rick Wallace heads up the north sound rides and longtime member, Doug Barritt cooks up rides in the south sound. These monthly rides follow the monthly breakfast meeting. The club continues its tradition of a state rally, currently held every July in Republic, Washington, which provides both pavement and off-pavement options. Bell and Muir want to continue to inject an element of safe riding within the club so members can learn better skills based on presentations and possible intermediate riders courses that are set up just for club members. 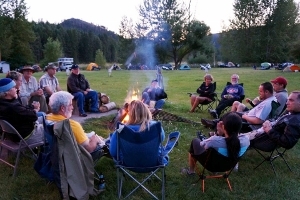 Photo: Hanging out in the evening at one of a number of campouts WSBMWR puts on each year. As always, club membership is open to owners beyond the BMW marquee. For more information visit http://www.wsbmwr.org, like ‘em on Facebook or check out the interview with the co-presidents on The Sound RIDER! Show.